We’d love your help. 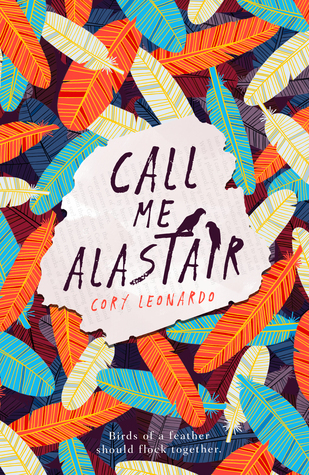 Let us know what’s wrong with this preview of Call Me Alastair by Cory Leonardo. of escape, to fly off with his beloved sister, Aggie. and their flight to freedom. To ask other readers questions about Call Me Alastair, please sign up. This was a DNF for me, as I personally couldn't connect to the writing style. However, I can definitely see lots of younger readers reading and enjoying the adventures of Alastair and Aggie, the brother and sister parrots. Also, the cover is very pretty! A grumpy African grey parrot who plucks his feathers. A twelve-year-old boy who longs to become a doctor and who has recently lost both his grandfather and his father. An elderly woman who loves to dance and bake pies and who writes letters to her dead husband. Are there any three characters in fiction less likely than these to appear together in a children's story? Are there any three characters less likely to develop a relationship with each other? Are there any three characters less likely to A grumpy African grey parrot who plucks his feathers. A twelve-year-old boy who longs to become a doctor and who has recently lost both his grandfather and his father. An elderly woman who loves to dance and bake pies and who writes letters to her dead husband. Are there any three characters in fiction less likely than these to appear together in a children's story? Are there any three characters less likely to develop a relationship with each other? Are there any three characters less likely to have a happily-ever-after ending? It took me a while to warm up to Alastair (the African grey), Fritz (the boy), and Aggie (the elderly woman), but but, as soon as I did, I fell in love with them all. Each has strong drives: Alastair wants to free himself and his sister from their dismal life in a gloomy pet store and fly away to live in a palm tree. Fritz wants to become a medical doctor and he is working at the pet store to save up enough money to buy a parrot. Aggie is deeply lonely after her husband dies and her only son moves away, and she longs for a pet that will be good company for her. Thanks to Edelweiss Plus for an ARC of this book! I really, really loved this one. Every single character, whether human or animal is so lovable each with a distinct personality. I found myself laughing, smiling and slightly tearing up during this book. Very cleverly written to be enjoyed by people of all ages. I can see both kids and adults liking this one. It's going to be hard to wait for the hardcopy because I want to talk this one up so badly. This one went on my favorites shelf. This is the story of a grumpy parrot who wants nothing more than to escape captivity with his sister and bring her out into the wild world where he's sure they'll both be better off. Alastair is endearing, even though he's a cantankerous curmudgeon--mostly because his heart is in the right place. He's spent his whole life trying to protect his sister, and you can't help but empathize with him, even when you think he's going about things all wrong. The story features some delightfully zany characters (both human and animal)--my absolute favorite by far is Bertie, the elderly woman who ends up adopting Alastair. And I enjoyed Alastair's poetry, which is mostly based off of reimagined classic poems. The pacing in the middle felt a tiny bit slow, but the fabulous ending was worth it, and I appreciated the central messages of finding happiness in your current circumstances (even when they aren't what you planned) and finding people who care about you in unexpected places. Overall, a wonderful middle grade read! I'm not exaggerating when I say this is one of my favorite middle grade books of all time. Cory Leonardo has an incredible gift with prose and poetry; I read this several times before it got its book deal, and without fail, I cried each time. Incredibly uplifting, soul-swelling, transformative. Three words to describe this book, quirky, whimsical, and playful. What an awesome debut novel with a refreshing and unique narrative. The story is told from several view points, mainly Alastair (the parrot), letters Bertie is writing to here deceased husband, and Fritz's medical journal. Now it took me a bit to get used to seeing things from a parrots perspective but once I got into the story, it flew by (pun intended)! Alastair goes a crazy journey over the course of the book. From endlessly searching for his sister to plotting numerous escapes, he was constantly struggling. But over the course of all these adventures, he realizes that maybe the grass isn't greener on the other side. And maybe, just maybe he ended up where he should have been all along. Also, to truly love someone, you have to realize what's best for them...even if its letting them go. I think this will resonate with the middle grade genre. You hear about bullying, friendships, the healing powers of pets, divorced parents and the mark they leave; the book is so much more than a crazy African grey parrot on a journey of self discovery. The ending took me by surprise but I will say, it left a big cheesy grin on my face. But In the description of The Simple Art of Flying it said perfect for fans of The One and Only Ivan! Hmmm, I wasnt sure I believed it, since that was an amazing story, but it’s true. This is an adorable tale of family, friendship, gratitude and growing up. This is a wonderful middle grade book that children will love! I’m guessing kids everywhere will be begging for a pet bird after reading this story! It’s almost enough to make me want one, and we already have dogs, a cat and two rats! Thank you to Simon and Schuster and NetGalley for this wonderful advanced copy, in exchange for my honest review. This will appear on my blog Friday, February 8, 2019. When I saw this book at The Strand, I knew I couldn't pass it up. First off, there are parrots on the cover, and second off, doesn't it just sound so sweet? But even though I may have been drawn in by the sweetness, there's still a lot of grit in The Simple Art of Flying. At the heart of this book is the relationship between Alastair and his sister Aggie and this relationship is full of a lot of tough topics like the fact that they're not regularly fed in the pet store. So while it's Alastair's When I saw this book at The Strand, I knew I couldn't pass it up. First off, there are parrots on the cover, and second off, doesn't it just sound so sweet? But even though I may have been drawn in by the sweetness, there's still a lot of grit in The Simple Art of Flying. At the heart of this book is the relationship between Alastair and his sister Aggie and this relationship is full of a lot of tough topics like the fact that they're not regularly fed in the pet store. So while it's Alastair's POV, it's also Fritz's perspective, the little boy who ends up adopting Aggie, and Albertina, the one who takes in Alastair. Through their perspectives we are able to see snippets of their lives. The Simple Art of Flying has got to be the cutest and funniest books I’ve read in a very long time. That’s not an exaggeration either—the main characters are birds who are just so misunderstood. Especially Alastair. He deeply cares for his sister, Aggie. She’s sweet and grounds her grumpy brother. Then there’s Fritz and Bertie who I equally loved. Both really brought the story to life. Fritz is the twelve year old boy that ends up buying Aggie. While Bertie is the one who gets Alastair. All our The Simple Art of Flying has got to be the cutest and funniest books I’ve read in a very long time. That’s not an exaggeration either—the main characters are birds who are just so misunderstood. Especially Alastair. He deeply cares for his sister, Aggie. She’s sweet and grounds her grumpy brother. Then there’s Fritz and Bertie who I equally loved. Both really brought the story to life. Fritz is the twelve year old boy that ends up buying Aggie. While Bertie is the one who gets Alastair. All our broody bird wants is to get back to his sister. The shenanigans and adventure we’re taken on is both endearing and amazing. I adored this story like no other. It’s a melt your heart and dance like no one is watching type of book. You know the kind—quirky and makes you feel so good! The characters make this reading experience so much better than I could have ever imagined. I look forward to reading more from Leonardo. This charming middle grade story, told in three voices, is overflowing with fun and quirky characters. We first meet Alastair, an African Grey Parrot, as he is fights to break out of his shell. His strength and determination are apparent from his very first moment of life. His ultimate goal in life is to escape the pet shop, find freedom for his sister and himself and to live in Key West. Next, almost 12 year old Fritz shares his story. We learn he will fiercely fight to care for, and to protect This charming middle grade story, told in three voices, is overflowing with fun and quirky characters. We first meet Alastair, an African Grey Parrot, as he is fights to break out of his shell. His strength and determination are apparent from his very first moment of life. His ultimate goal in life is to escape the pet shop, find freedom for his sister and himself and to live in Key West. Next, almost 12 year old Fritz shares his story. We learn he will fiercely fight to care for, and to protect, any animal or human being. He’s obsessed with all things medical, dreams of becoming a doctor and keeps a “Official Medical Log”, where he records his personal health statistics. He constantly searches for the courage to be himself, as he works toward his goals. And finally there is Albertina Plorky, perhaps my favorite of all. This 80 year old woman strives to happily dance through life, even though she is grieving her husband who passed away and for her son who has moved halfway across the country. I loved her positive outlook, her kindness, her gentleness and the support and understanding she has for both Alastair and Fritz. Even the minor characters of Fritz’s sister, Fiona, and his mom were delightful. Fiona gave Fritz lots of love and understanding, and Mom, even though she was working multiple jobs, gave both Fritz and Fiona much support and acceptance despite their quirkiness. So many of you will love this book. The animal lovers will love seeing the world through Alastair’s eyes. Middle grade kids, who may be feeling they are a little quirky, will find assurance they can succeed in the world, despite being a bit different than their peers. And finally, anyone simply looking for a good story with lots of smiles and lots of heart, this is a book for you. It will be released 2.12.19. Be sure it’s on your list to arrive on publication day. It’s a winner! You know how sometimes you read a book that taps in to your own personal struggles so deeply, it's like the author had a window into your soul? This is one of those. Two years ago, Amanda Rawson Hill and I had the immense privilege of mentoring Cory Leonardo during our first stint as #PitchWars mentors. Cory's poetry-laced book about a curmudgeonly African Grey named Alastair who is so fixated on his own vision of what happiness looks like that he can't see the wonderful life that has fallen into You know how sometimes you read a book that taps in to your own personal struggles so deeply, it's like the author had a window into your soul? This is one of those. Two years ago, Amanda Rawson Hill and I had the immense privilege of mentoring Cory Leonardo during our first stint as #PitchWars mentors. Cory's poetry-laced book about a curmudgeonly African Grey named Alastair who is so fixated on his own vision of what happiness looks like that he can't see the wonderful life that has fallen into his lap immediately spoke to both Amanda and I. The central message—that happiness, and home, and family, can be found in the most unexpected of places, but that you can cheat yourself out of all of them if you can't stop clutching at the way you thought things were supposed to be—feels, in many ways, like the theme of my whole life. Each time I've read this story, I've cried at the end, when Alastair finally wakes up to the beauty that's all around him, which he nearly missed for his focus on the things he wanted but couldn't have. I was lucky enough to read an ARC of this book. It is a beautifully written, lyrical, poignant book that offers the best of middle grade: humor and heart. I fell in love with cranky Alastair, sweet Aggie, nerdy Fritz, and irrepressible Bertie. This book is about pursuing your dreams, and knowing when to let them go because what you've always wanted is what you already have. Read it for the story, and prepare to be floored by the poetry. Can't wait until my hardcover copy arrives! This is one of the cleverest, most beautiful books I've ever had the pleasure of reading. I used to think it was a mix of THE ONE AND ONLY IVAN and FLORA AND ULYSSES. But I've changed my mind. It's THE ONE AND ONLY IVAN meets BECAUSE OF WINN DIXIE and THE MIRACULOUS JOURNEY OF EDWARD TULANE. I love it so much. Fouryh time reading it, still cried. This book is truly Kate DiCamillo meets Katherine Applegate. It has amazing voice, lovable characters, beautiful poetry, and will make you laugh, then cry, then laugh again. DON'T. MISS. IT. This was sad, happy, charming, and gently funny. A beautiful book with a bittersweet ending. It reminds me a lot of The One and Only Ivan, by Katherine Applegate—another fantastic book. But my reactions are a little different. My only (small) issue with the One and Only Ivan is that it's a little hard to believe in parts. Ivan seems to know or understand things he would have no way of knowing, given what we know about how he learns, and I question why he can speak to the other animal species so e This was sad, happy, charming, and gently funny. A beautiful book with a bittersweet ending. It reminds me a lot of The One and Only Ivan, by Katherine Applegate—another fantastic book. But my reactions are a little different. My only (small) issue with the One and Only Ivan is that it's a little hard to believe in parts. Ivan seems to know or understand things he would have no way of knowing, given what we know about how he learns, and I question why he can speak to the other animal species so easily but can't understand humans. This doesn't seem quite internally consistent, and I'm a proponent of books being internally consistent—be they strictly modern day, far-distant future, or high fantasy. Now, fast-forward to "The Simple Art of Flying." Objectively, it's way more difficult to believe. The voices of the animals are way more human than Applegate's delightful rendition of a gorilla's thought processes and inner voice in "The One and Only Ivan." 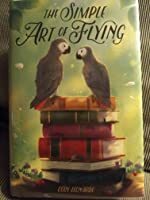 In "The Simple Art of Flying," Alastair and others use slang and cultural references they shouldn't use or understand, even if they are highly intelligent animals that can communicate amongst themselves. But here it doesn't bother me. And the difference? Internal consistency. "The Simple Art of Flying" is so fantastical (Alastair reads by eating paper—and he knows pretty much everything—and the goldfish can analyze poetry—and the guinea pig plays poker). Because it's so fantastical, it doesn't seem out of place that they all talk like humans. It feels more internally consistent. These are both great books. I love them both. I just found my different reactions interesting. Anyway, I love the characters in "The Simple Art of Flying." I love the writing, the story structure, the pacing, the unusual premise, and the even more unusual theme. When it all began, I couldn't quite I admit it...at first GLANCE I was in love...I mean really, how can you not be? That cover is absolutely stunning! Between the books, the color scheme, and the magical nature of the art, I was enamored. Thing is at first read, I wasn't quite sold. It's only now, weeks after I've finished the book and am revisiting my experience to put it into words for all of you, that I can fully appreciate the journey our young feathered friend (and others) truly takes us on. I own African Grey Parrots, and they are almost never found on merchandise and are rarely found in books. It's always the colorful macaws (even though Greys are smarter, ha!). So of course I had to read The Simple Art of Flying. I enjoyed reading it, although my enjoyment was tempered by all the non-Grey-like behavior. (For example, one parrot comforting another by putting her wing around him. Not gonna happen. They might huddle together, or clack beaks, but it is not physically possible for a pa I own African Grey Parrots, and they are almost never found on merchandise and are rarely found in books. It's always the colorful macaws (even though Greys are smarter, ha!). So of course I had to read The Simple Art of Flying. I enjoyed reading it, although my enjoyment was tempered by all the non-Grey-like behavior. (For example, one parrot comforting another by putting her wing around him. Not gonna happen. They might huddle together, or clack beaks, but it is not physically possible for a parrot to hug another parrot.) Also, the cat was very adversarial with one of the parrots and in my experience cats give Greys a wide berth and are fairly intimidated by them. The pet shop where the parrots are hatched is terrible, but the anti-pet shop message could have been even stronger. One of the parrots chews up books and somehow absorbs the content, leading him to write a bunch of poetry. Most of the poem's that he mimics (like his "On First Biting into Norton's Anthology," inspired by "On First Looking into Chapman's Homer" by Keats) are clearly aimed at adults, not children, which, I don't know, maybe the author thinks parents will read the book to their children? The strength of the book is its two main human characters. Fritz works part time at the pet shop and wants to be a doctor. Bertie is a lonely but lively old woman trying to keep her spirits up. Each adopts one of the sibling parrots and they become friends. The Afterward, which wraps up the story and then some, was very touching. The book starts out with two African greys named Alastair and Aggie who have spent their whole life in Pete's Pet (and parrot) Store. There Alastair and Aggie have dreams of escaping the pet store to have their own life in the outside. Then 12-year-old Fritz who works as stocking shelves there finds an interest in the 2 African greys, when he realizes that they cost $1,200 he works at Pete's and mows lawns to try and save up and by one of the parrots. While he is saving up for the parrots he doe The book starts out with two African greys named Alastair and Aggie who have spent their whole life in Pete's Pet (and parrot) Store. There Alastair and Aggie have dreams of escaping the pet store to have their own life in the outside. Then 12-year-old Fritz who works as stocking shelves there finds an interest in the 2 African greys, when he realizes that they cost $1,200 he works at Pete's and mows lawns to try and save up and by one of the parrots. While he is saving up for the parrots he does a lot of research about the animals and becomes fascinated by them. During the time that Fritz is working for his money Alastair breaks his wing due to Pete messing around. Then Alastair notices that Fritz is showing a lot of attention and love to Aggie and realizes that Fritz will only have enough money to buy one of them and that one is Aggie. When Fritz is about half way there he runs into a problem when pie baker and dance lover Alberta (Albertina) Plopky finds an interest in the birds and is interested in buying them. This is Cory Leonardo's first novel. I felt that she did a very good job on the storyline and that even though at some points of the book it was a little childish I feel it's a great book. I felt like the word choice that Cory did was on point and that she is going to be a great author with many other great books like this. First, can we just take a minute to talk about this cover? It’s absolutely adorable! I love the birds, and the books, and the colors. That alone would pull me into the book. Second, can I just tell you that I wish we had books like this when I was a kid! Don’t get me wrong, Beverly Cleary, Ramona Quimby, The Baby Sitters Club, and a few others were awesome. But, books like TSAOF would have been happily devoured then, too! I absolutely adored Alastair. I’m not a fan of birds, but it they were all First, can we just take a minute to talk about this cover? It’s absolutely adorable! I love the birds, and the books, and the colors. That alone would pull me into the book. Second, can I just tell you that I wish we had books like this when I was a kid! Don’t get me wrong, Beverly Cleary, Ramona Quimby, The Baby Sitters Club, and a few others were awesome. But, books like TSAOF would have been happily devoured then, too! I absolutely adored Alastair. I’m not a fan of birds, but it they were all like Alastair I would have a dozen! I loved his curmudgeon quirkiness, and his ability to pull you into the story, along with his sister Aggie. His poetry was awesome and captivating! And, Fritz. Let me tell you what. I saw a lot of my own kiddos in Fritz. He was just lovable. And, Bertie! The perfect “grandma” for the story. I loved her laugh-out-loud moments in the story. This debut novel by the amazingly talented Cory Leonardo is one that should be on every young reader’s shelves. It’s filled with life lessons, lots of laughter, characters who will become friends, and lots of fun. If you have a younger reader, age 8 and up, I would definitely recommend you get this for them. It’s worthy of 4 stars, for sure! Great job on your debut, Leonardo! This book was cute and really funny. It has some really good humor in it that I think is thrown in for parents. It was a bit slow for me, but like I said, it was cute. This was such a lovely story! Didn’t finish. Just didn’t hold my attention! This sweet middle grade book is about a pair of African Grey parrot siblings who get sold to two different homes and are searching for their way back to one another--and ultimately, to freedom. Told in three different voices, the story offers MG readers unique perspectives: part personified animal, part grieving adult, part 12-year-old boy. For lovers of animals and lovable misfits. So very much to love about this touching, hilarious book especially the viewpoint of perpetually cranky parrot-poet Alastair. Charming and delightful, hilarious and heartwarming, this book is going to find many many fans. Highly recommended! Thank you @kidlitexchange @coryleonardo and @simonkids for a review copy of this book. All opinions are my own. This MG book releases 2.12.19! Oh my goodness, this is such a sweet, captivating story. It’s told from three very different perspectives. There’s Fritz, who is a young teen. He’s obsessed with the medical field and dreams about becoming a doctor one day. He is also a huge animal lover and works at the local pet store. This is where he meets and cares for Alastair and his sister Aggie. T Thank you @kidlitexchange @coryleonardo and @simonkids for a review copy of this book. All opinions are my own. This MG book releases 2.12.19! Oh my goodness, this is such a sweet, captivating story. It’s told from three very different perspectives. There’s Fritz, who is a young teen. He’s obsessed with the medical field and dreams about becoming a doctor one day. He is also a huge animal lover and works at the local pet store. This is where he meets and cares for Alastair and his sister Aggie. They are African Grey Parrots who were born at the shop. Alastair spends a good majority of his time plotting an escape while Aggie seems to enjoy the idea of being a pet and becoming attached to a human. The final main character is my absolute favorite. Dear Mrs. Plopky is an elderly widow who is doing her best to live on her own. She decides one day that maybe she wants a companion and should adopt a bird. The story progresses and switches back and forth between these charming characters. Each provided quite a bit of humor, but also brought up important topics along the way. Fritz is such a sweet young boy. I loved his medical field entries and the kindness he truly showed on everyone he encountered. I’m so glad the author concluded with showing us a glimpse into his future and the man he had become. It was perfection!!! Alastair cracked me up. His antics, as well as many of the other pets, were so entertaining. It’s fun to imagine that an animal can think in those terms and have conversations amongst themselves. I loved that he could taste what a story was about and was such a troublemaker. He also wrote some great poetry. Watching his journey, especially the later half, was so special. (Trying my best not to give anything away here). Mrs. Plopky won me over from the very first moment we met her. I loved her letters to her dearly departed husband and her menagerie of unsocial pets. She had so much fabulous wisdom to share with these characters. This beautiful book is poetically written and covers loss, love and letting go. Told through the narrative of a poetic parrot, a lonely old lady and a boy who dreams of being a Doctor. Who knew I could care so much about this small group of characters, but this book took me through tears and laughter in the two days it took me to enjoy its pages. It’s not often you get to read a book from the perspective of an animal. This was no Animal Farm (thankfully), but we do see a series of different anima This beautiful book is poetically written and covers loss, love and letting go. Told through the narrative of a poetic parrot, a lonely old lady and a boy who dreams of being a Doctor. Who knew I could care so much about this small group of characters, but this book took me through tears and laughter in the two days it took me to enjoy its pages. It’s not often you get to read a book from the perspective of an animal. This was no Animal Farm (thankfully), but we do see a series of different animals living in the pet shop. I loved seeing the dynamics of how this worked, it was very cleverly written. I think setting this in a bookshop is a really unique idea, as I child I would have loved this… in fact, I do as an adult! Alastair is our main character, he is a parrot and at the start of his very simple life, he is living with his sister Aggie. The tragedy of this story is that we know that this pair have to be separated and I can’t bare how this is going to make Alastair feel. The blurb has set us up for heartbreak, but it doesn’t make it any easier. Alastair is such a sweet little bird, his nods to depression are vital to educate young people that it is okay to feel sad and there will always be people who care. He is perfectly personified through his narration of the story. His love of poetry (and cherries) adds a different take to animals in books that I can’t say I’ve ever come across before. I love the mix of how we see the different narratives telling the story; Fritz (the young boy) wants to be a Doctor one day, we see his perspective through his medical log. He’s a funny little boy who has a clear passion for caring for people and animals. He is innocent and young, he is our reader, wanting the best for these parrots. Bertie breaks my heart, she writes letters to her husband, this is how we get her perspective. She is lonely, desperately trying to find friends in both people and pets. I want to be her friend, or to attend one of her social activities to show her that people do care! She seeks friendship in Alastair, an example of how we can never guess who we will get on with the best, no matter our interests.